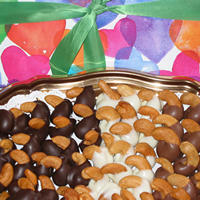 "I wanted to thank you for the fabulous dipped chocolate cashews. They were a big hit at my husband's 60th birthday celebration..It was a pleasure working with you and I look forward to working with you in the future." Jumbo roasted Brazilian cashews are half-dipped in creamy chocolate to create the perfect combination of sweet and crunchy. Available in bittersweet, milk, white chocolate and Assorted. Be careful, they are addictive. Bittersweet variety is pareve/non-dairy. Half pound, one, two and five pound boxes available. $36 per pound; $22 per half pound.